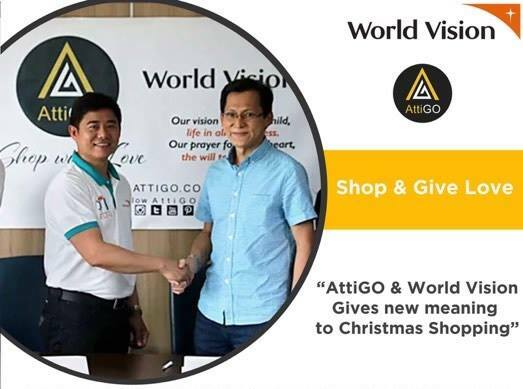 A weird partnership between AttiGO and World Vision Development Foundation (WVDF) created a a platform where shopping could also be giving. This partnership will support community programs aimed at improving the lives of over 20,000 children and 16 million people in 33 provinces and 44 cities in the Philippines. An unusual pairing yet it turned to be a good one. The partnership created a voucher the code "WorldVisio60th". This code gives shoppers discount on AttiGO products and part of the proceeds goes to WVDF. It gives opportunity to AttiGO's customers to help raise funds for a child's schooling and provide sustainable livelihood to sponsored families while shopping on the online platform. Furthermore, customer can donate an additional amount to his or her charity of choice. So as the saying goes, "It's better to give than to receive." For the holiday season, a part of the proceeds with the voucher code "WorldVision60th" is used, will help the WVDF raise funds for them to give Noche Buena packages to their partner communities. As they do their Christmas shopping on AttiGO, they are also helping bring the joy of Christmas to different families. You don't only get discount on your items, a reliable and fast delivery, but you also get to help support the different community programs of the World Vision.